Kuo, of KGI Securities, issued a new research note on Thursday, a copy of which was obtained by AppleInsider, in which he said he believes a so-called "iPad Air 2" will be unveiled by Apple next Tuesday. That would be alongside the 4.7- and 5.5-inch versions of the "iPhone 6," as well as a wearable wrist-worn device. 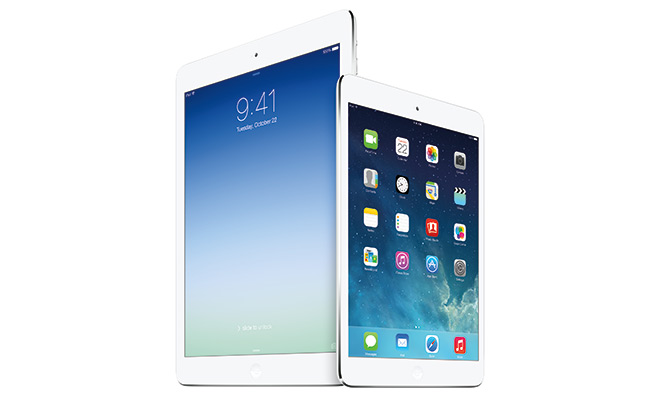 Kuo stated that "only iPad Air 2 will see significant spec upgrades," suggesting that the company's iPad mini may not be given as much attention in 2014. Kuo said that the iPad mini "may" be updated this year with a Touch ID fingerprint sensor, but expressed less confidence about the company's diminutive 7.9-inch tablet. If Apple were to release a new iPad at next week's event, it would be something of a surprise— the company is also expected to hold an October event to introduce new products. In years past, this event has showcased new iPads, including last year's unveiling of the iPad Air and second-generation iPad mini with Retina display. But unlike last year, when the iPad Air was given a redesign with a much lighter and more svelte appearance, neither the iPad Air nor iPad mini are expected to see redesigns this year. Apple's Sept. 9 event will be held at the Flint Center in Cupertino, Calif. It begins at 10 a.m. Pacific, 1 p.m. Eastern next Tuesday, and AppleInsider will be there live.